Walk inside and for a guaranteed piece of stinky culinary heaven, order up one of these beauties. Art that you can put in your mouth and savor. It’s worthy of an NEA grant. Giros (or kebabs as they’re often called in the UK) can be just divine. We’ve got loads of Turks and Greeks here in Adelaide that make some of the best I’ve had. 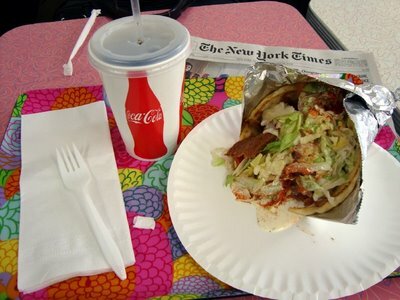 The last time I had a Gyro, I followed it up with a Ferris wheel ride at the Mississippi State Fair. That huge error in judgment was madetwenty years ago. Daisy: You can always lick your monitor. It’s empty calories!AFM: In any language, they’re an inexpensive gourmet treat.Nurse: Things go better with the New York Times, as well. I enjoy having a dining companion but sometimes there’s nothing better than stuffing your face and burying it in the paper between bites.Cat: Welcome! 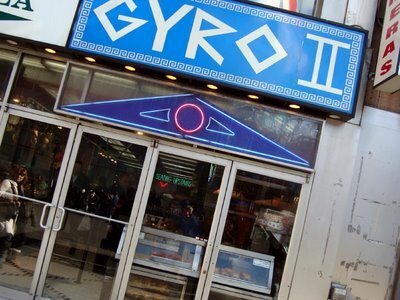 It’s time to get back up on that gyro pony. Never mind the food. The tablecloth alone is a feast for the eyes. Haha…we ate those in Greece last summer. First time I ordered one I didn’t really know what a gyro was, so when it arrived I just kind of looked at it and picked around it a bit. Wasn’t keen. Dodgy foreign chicken. We have a little place here in Fort Sask that makes pretty good donairs (or gyro’s, if you will). I’ve only had one once and didn’t really care for it. However, they make a pretty good veggie wrap and Annie and I try to eat there at least once a week. It’s a nice snack out and it supports a local entrepreneur.Annie once wrote about the place a while ago.